Have you ever wanted to tell someone what you really thought about them? Like really, really, thought of them? Yea, me too. So you can imagine, I was a bit nervous to read through the reader survey answers. After all, I am simply a working mom behind this blog. But it’s so important to know what your opinions. Are you interested to see if other moms feel the same as you? I love reader surveys. How else could I ever learn more about you? The answers are pretty honest (sometimes brutally so!) and really give me an idea of who my readers are and how I can help them out around their home. 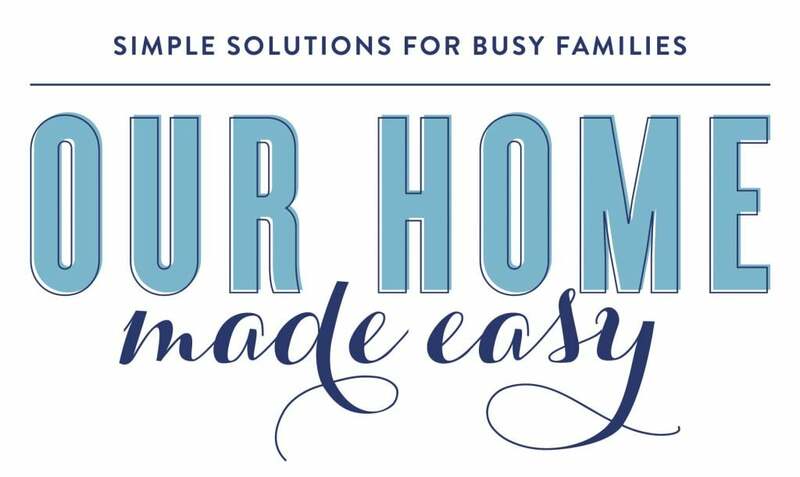 After all, I really love to inspire you for simple solutions for your busy family. As insecure as I may feel opening the results, they are so great to have. You know what’s worse than a moment of insecurity? Not knowing what you, my readers, want to read. Not knowing what you really don’t like. Yea, that is much worse than allowing myself to keep my head in the sand (or buried behind a laptop in this case)! Have you noticed the new logo on top of the screen? Our Home Made Easy needed some freshening up and I thought a new logo would be that breathe of fresh air. It was designed by the super talented designer, Alison McKown of Just Add Confetti. Fellow bloggers— when you need quality graphic design work, get on her waitlist! It’s totally worth it. I almost feel like I know what I’m doing now. Just kidding– I’m pretty sure I’ll always feel like the new kid when it comes to blogging. 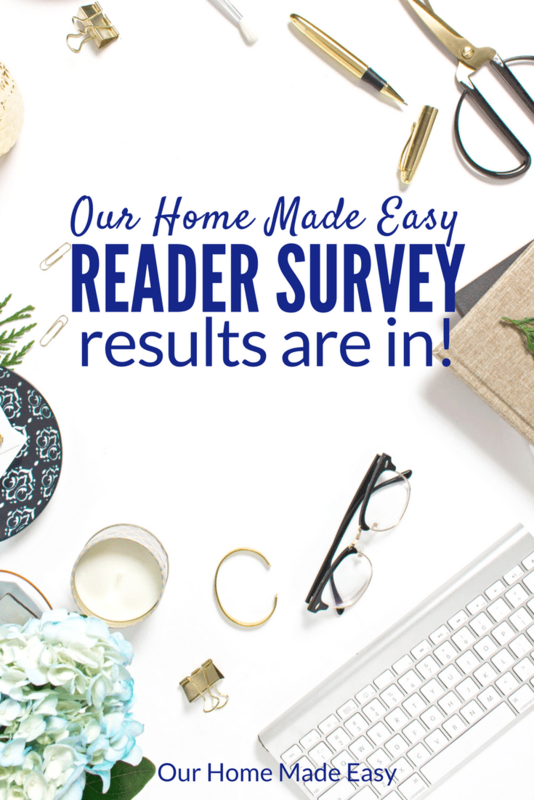 And now on to the Winter 2018 Reader Survey Results…. How does this affect how I will create content? It doesn’t change much– only for this reason. I really cannot please everyone all the time. 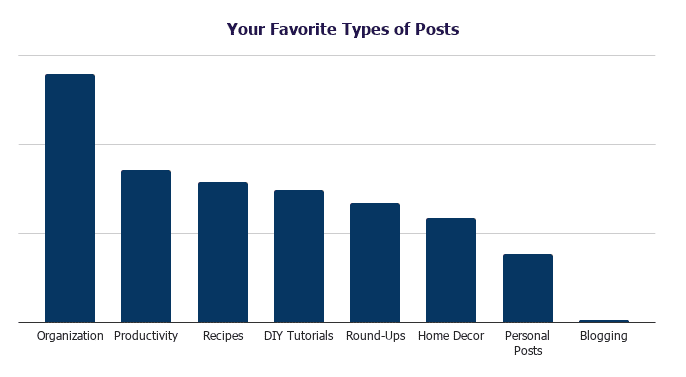 But what I will do in the future is to make sure that each category is spread out so that we don’t have huge amounts of DIY without a recipe or some home decor. 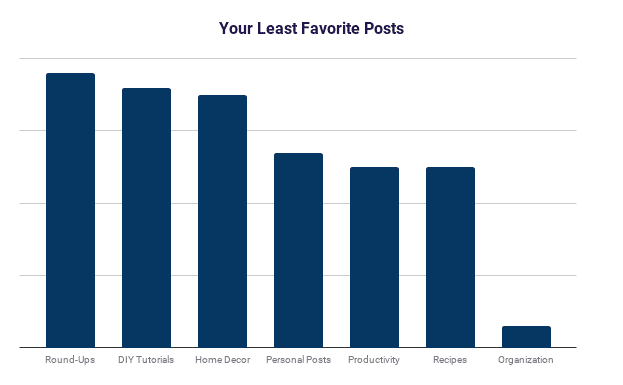 Seeing this graph reinforces that I really need to keep all the categories I have on the blog. This one is always my favorite! If it was me, I’d happily give away the cleaning! It looks like the doing the dishes after dinner was the runaway favorite. I agree, it’s a good one to give-away. Cleaning the house included all the bathroom responses. 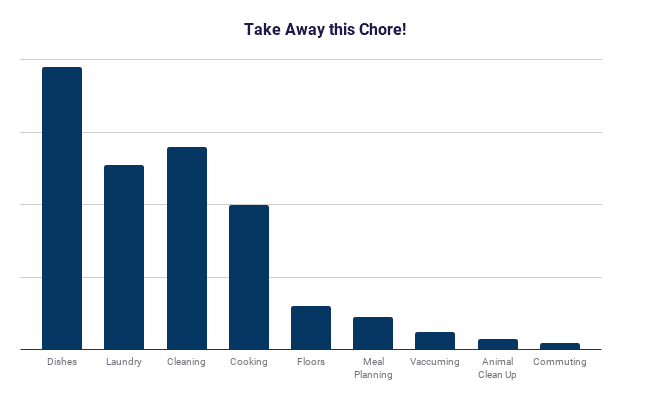 It seems like cleaning the bathroom should’ve been it’s own category! The survey was extremely helpful for me to read. It helps me focus my year on what you want to read and learn more about on this blog. I cannot wait for an amazing 2018 and I have you to thank for be willing to take 2 or 3 minutes and helping me out!